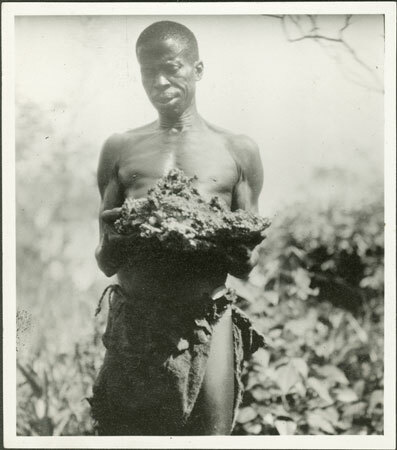 A man holding up a lump of iron ore. Smelting of iron ore seems to have been uncommon by the mid 1920s due to the availability of trade iron, but smith working of metal was still frequently practised. Notes on print/mount - "52 +32 EPA616"
Morton, Chris. "Zande smith with iron ore" Southern Sudan Project (in development). 03 Jan. 2006. Pitt Rivers Museum. <http://southernsudan.prm.ox.ac.uk/details/1998.341.616.2/>.